Social programming is a set of learned beliefs and behaviours, influenced by parents, family members, friends, teachers and peers. These form part of our socialization process, which determine our role and place in society. Social programming is a subconscious process that causes us to make assumptions about how things work. We can compare it to that of software on a computer. If your software is outdated or inaccurate, you can’t interpret things differently until you rewire your programming. Most South Africans are conditioned to consider waste as something that is no longer useful and should be discarded of. Out of sight, out of mind, but… do we realize the consequences of our wasteful culture? Landfills, otherwise known as rubbish dumps or “tips”, are sites for the disposal of waste by burial. It is the oldest form of waste management. The problem is that landfills are filling up and releasing harmful toxins and gases into the soil and atmosphere. Soon new landfills will need to be established. Selecting new premises to establish a landfill site can be very challenging. Landfills need the correct underground mix of rock and clay and cannot be anywhere near underground water, wetlands or other environmentally sensitive areas. Ideally a landfill site should be close to the source of the waste, but cannot be too close to residential areas due to noise, dust, emissions and other health and safety concerns. Make an active choice to consider the impact of your actions on the environment. Keep it simple. Start by considering your shopping basket, is the packaging something that can be recycled or not? Research your local recyclers and find out what they collect and where. Every time you discard of an item, ask yourself whether it really is waste, if it can be reused, or if it is a valuable resource that can be recycled into something new. Remember that every time you recycle, fewer natural resources are extracted from the earth. Be an independent thinker, set high standards, lead by example. Following your own vision takes courage. When committing to recycling, this does not end at home. Encourage friends and family to do the same, enquire about recycling at events, and set an example by collecting recycling at a family get together. We all want to think favourably of ourselves and to believe that we are contributing toward society and our environment. We cannot honestly believe this if we are not doing everything we can to make a difference. Stop looking for excuses not to recycle, and start thinking outside the box to find sustainable solutions! The Schools Recycling project is dedicated to instilling these beliefs and values and we are proud to award our top recycling schools for their efforts! Frans Conradie Primary won third place this term. 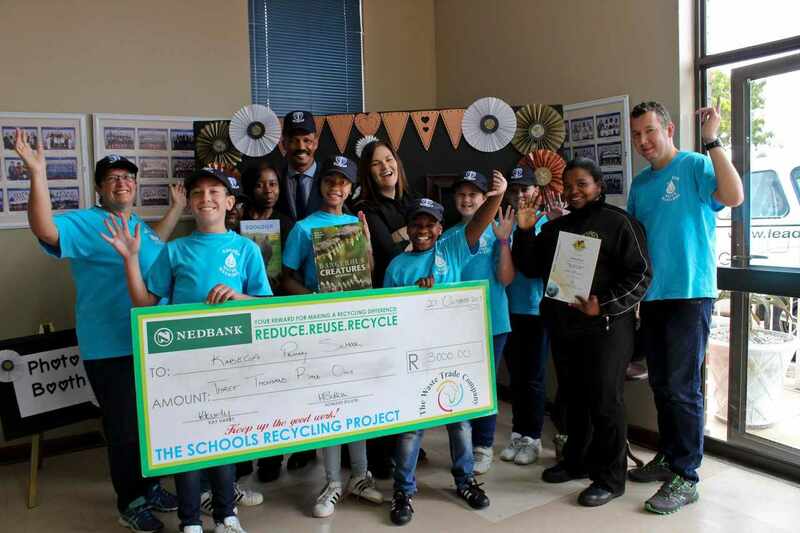 Their learners collected a total of 2464kg of resources for recycling! Christian Ferreira, teacher and enviroclub leader, was delighted to hear that they had won, "thank you to The Waste Trade Company and Mpact for the cash prize, we plan to either purchase more recycling bins or to take the enviroclub for an educational tour at the TWTC depot!" Mount Pleasant followed with a total of 2807kg of resources collected. Mrs Hugo is excited to further their efforts and plans to arrange a beach cleanup and a black and white recycling day, "the enviroclub really set an example for other learners at school, they sacrifice their break times to supervise the recycling station and to keep it neat and tidy, thank you to TWTC and Mpact for the prize." Ane du Toit, Grade 1 learner made a special request for people to empty their plastic bottles when sending them to school so that they don't attract bugs or smell bad. Trailblazer Kabega Primary set the bar high by collecting a total of 13354kg of resources! The Water Warriors accepted the prize, sponsored by Mpact Recycling. “Kabega Primary is the only Eastern Cape School that has been in the Sasol Forever Resorts Enviro Quiz finals for four years in a row, we are very proud of our learners who won 4th place this year!”, said Dr Adele Botha, teacher and Project Groenspoor coordinator. Kabega Primary sets a prime example, not only by encouraging their learners to recycle, but to welcome the public to bring their recycling to school too.